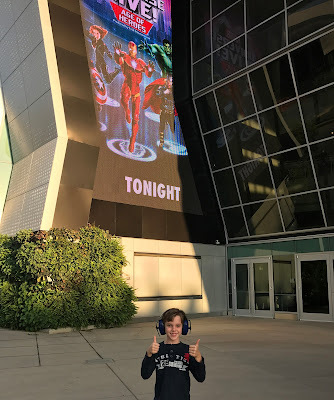 I’m not sure who was more excited to see the latest Marvel show, me or my eight-year-old son but "Marvel Universe LIVE!” is certainly an opportunity for family members to bond and geek-out together! The live-action show, heavy on special effects and stunts, is on tour now and just came my way to the Golden 1 Center in Sacramento, CA. 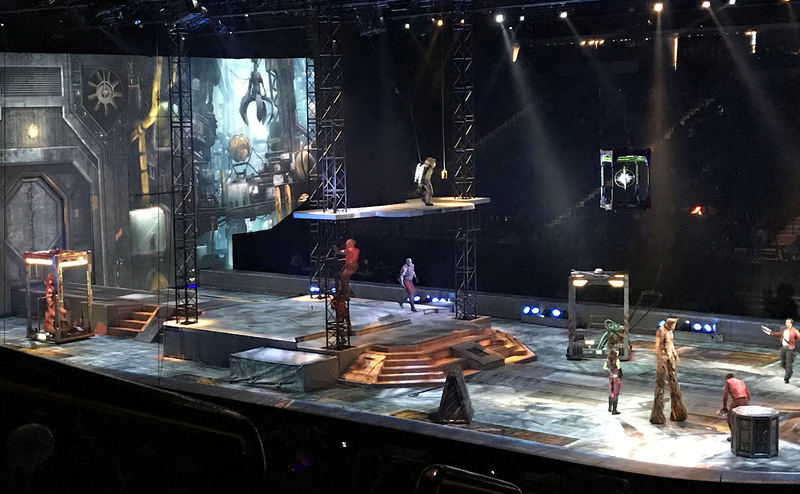 This was my first time going to this arena so I was excited to get a peek inside to see the layout and the show’s constructed sets. Hundreds of fans were walking in and I was overwhelmed by the cuteness of children all wearing their tiny Marvel costumes to show support for their favorite hero. Before the show starts, at first sight, the stage is unimpressive but when the show begins, the magic happens. To our surprise, we’d see the once boring, single-colored stage now illuminated with a full environment, which was digitally projected from above with the latest technology. 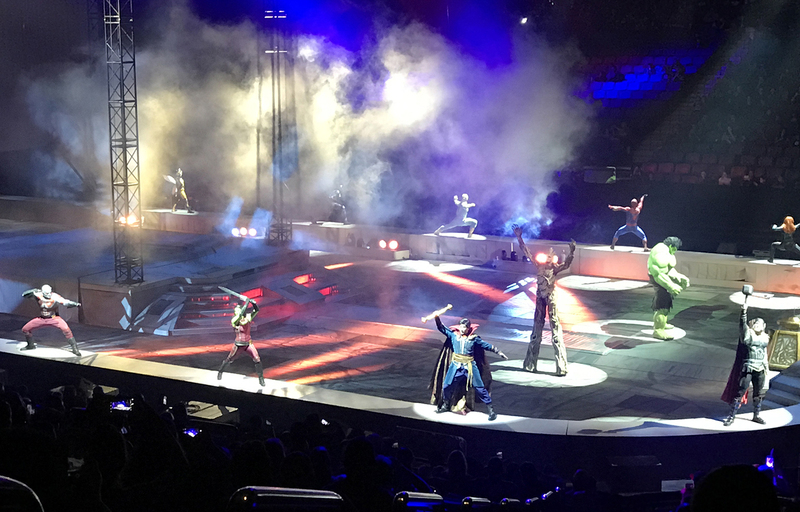 The show kicks off with a narration by Doctor Strange, who warns us that the greatest super heroes must race against time to recover the Wand of Watoomb before it falls into Loki’s hands. This ancient artifact would allow Thor’s evil brother to crown himself ruler of the universe! We’re then treated to our first action scene focusing on the Guardian’s of the Galaxy. Here the Guardians are on a mission to keep the Wand of Watoomb out of reach from the clutches of Nebula and Yondu and his Ravagers. After an entertaining yet unsuccessful attempt, it is next up to Spider-Man back in New York to retrieve the wand before his greatest foes get it. Perfectly timed from a computer-generated web-slinger on the background screen, the real Spidey actor emerges, swinging in on his web high into the arena! 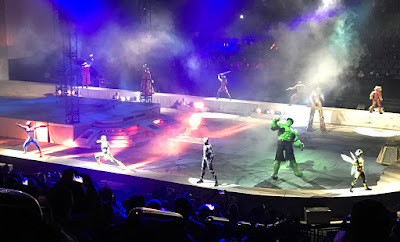 The costumes were very impressive for the villains including The Rhino, The Lizard, Electro, The Green Goblin and more. Whenever an act was over, a new environment immediately projected down onto the stage and also behind a massive backdrop screen. This projection, along with a couple bonus props, would allow us to jump quickly from many different locations to cities, to The Avenger’s tower, to volcanic underworlds and even to other worlds like Asgard and The Collector’s lair in space. 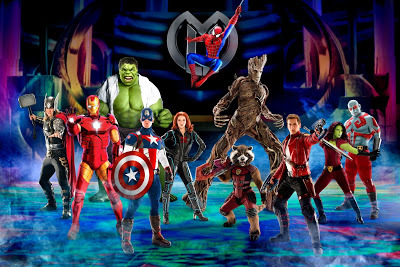 This show unites some of Marvel’s greatest Super Heroes including Iron Man, Captain America, Thor, Black Panther, Hulk, Black Widow and Iron First against some of the most threatening villains. The show’s two acts run about 40-45 minutes each, with a 15-minute intermission in between. 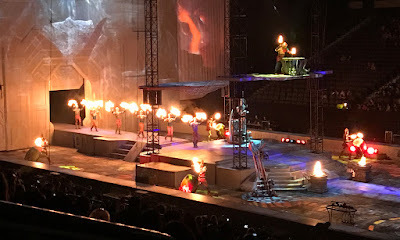 In addition to some amazing stunts and special effects, there were also a couple nice Cirque du Soleil style acts happening with a China setting (dancing dragons and acrobatics) and another scene from a volcanic underworld (fire dancers)! My only criticism was that the sound was a little low or that it appeared a little muffled. This could have been just the sound of this particular arena, however. Some of these shows can sometimes be TOO LOUD so my son brought his noise-reducing headphones but after a minute of the show starting, we knew this wasn’t going to be one of those ear-deafining events. The sound could have even been a tad louder but was a small issue for such grand entertainment. GO see this show and assemble your family of heroes! Marvel Universe Live Review – Marvel Universe LIVE! Age of Heroes will travel throughout North America on a multiyear tour, including stops in Denver, Las Vegas, Salt Lake City, Indianapolis, Atlanta, Dallas, Miami and New York. After North America, the show will embark on an international tour starting in 2019. 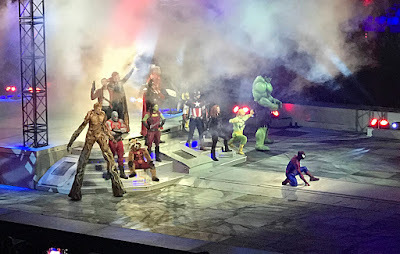 For a complete list of North American tour dates, locations and to purchase tickets, please visit MarvelUniverseLIVE.com.